It was a good thing that Grand Palace has vast grounds to wander around for free. We stayed here for a bit and took some photos. Since I have really nothing to tell about how Grand Palace and Wat Phra Keo looks from the inside, let me share with you some tips on how to avoid getting scammed outside the Grand Palace. 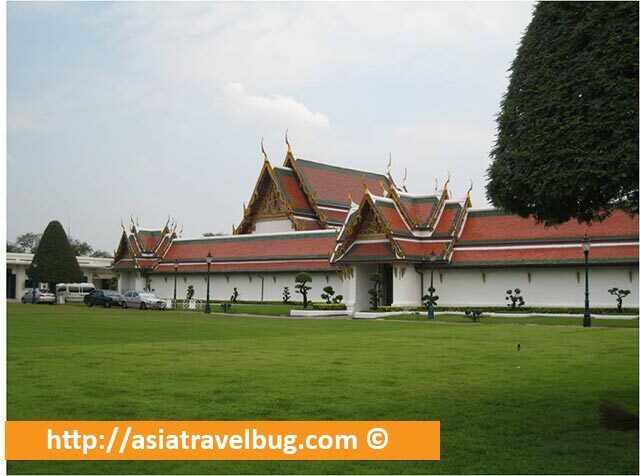 The Grand Palace has many gates but only one is open all the time which is the main entrance along Na Phra Lan Road. The correct entrance of Grand Palace is opposite to Au Bon Pain Bake Shop. 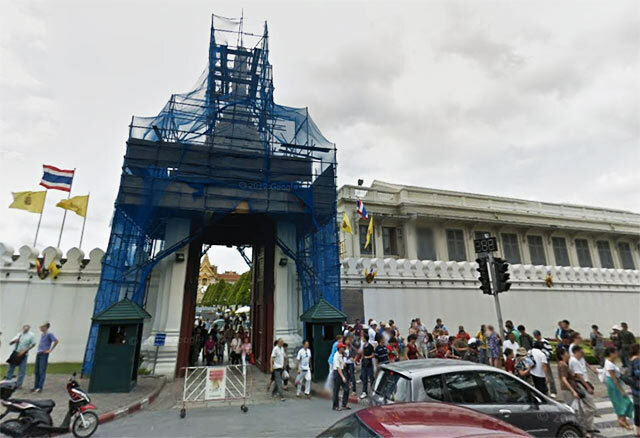 You need to be careful because there are so many scam artists lurking around the other gates which are closed, waiting for tourists looking for the entrance of Grand Palace. These scam artists will then approach you and say that the Grand Palace is closed for the day because it is Buddha day or whatever holiday, and will convince you that it is better if you go to visit another temple and go to the shop of the king. Eventually, the scam artist will offer you a cheap Tuk Tuk ride. DO NOT BELIEVE THEM! They are just luring you to go to the Royal Gem Factory which is one of Bangkok’s tourist traps. A number of scam artists tried to approach us using such kind of false story. 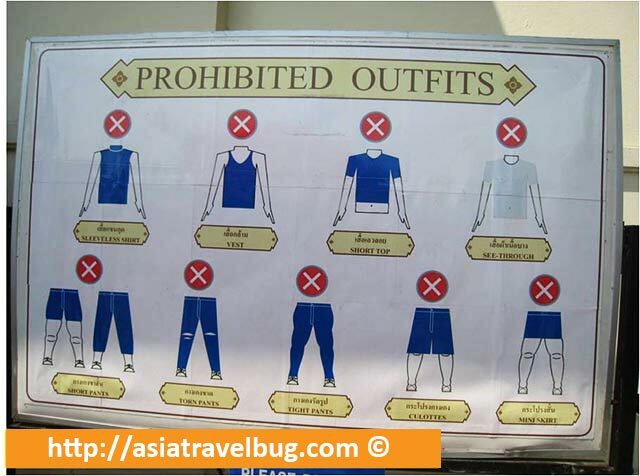 To be safe, do not entertain any strangers in the Grand Palace area. It was already noon time and we can not find a good restaurant near the Grand Palace. So we hailed a cab to go to Bangkok’s tallest tower – Bayoike Sky. I was surprised to see that the location of this famous tower is right in the middle of a very busy market in a very crowded street. Anyway, outside the hotel, there is an information booth where you can pay 200 Baht (~USD 6.25) to go observation deck [2014 Update: Price has increased to 300 Baht (~USD 9.50) including a drink]. We headed to the Bayoike Cafe in the 18th floor of Bayoike Sky for our lunch. The Bayoike Café has huge servings with very affordable prices. We had a steak meal for just 350 Baht (~USD 11) and roast duck meal for only 150 Baht (~USD 4.50). The meals we ordered were cheap but delicious. For 3 people, we only spent 1,000 Baht (~USD 31) including fruit shakes. This is definitely a good hotel restaurant which I would recommend. After our lunch, we wandered just for a short while in Pratunam area. 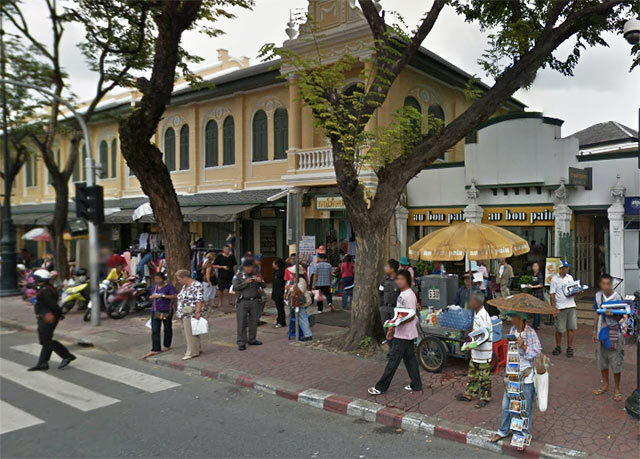 Pratunam is not really a touristy area but if you are a bargain hunter, this is the place to be. The place looks very similar to Divisoria Market in Manila. Our encounter with scam artists did not end at Grand Palace. We were again approached by a scam artist in Pratunam who tried to lure us to go to the Thailand Export Factory. To give you an idea, our conversation with the Pratunam scam artist went like this. Scene: Tourist wandering around Pratunam, looks like lost. Scam Artist: Hi! Where are you going? Tourist: I’m looking for XYZ place. Scam Artist: Oh, that place is closed today. Today is a national holiday. Why don’t you go to Thailand Export Center? It is so much cheaper than here. Can I have your map? I will write down the direction for you. Where are you from? Tourist: I’m from ABC country. Where are you from? Scam Artist: I’m from Brunei. I’m a doctor attending a conference here in Bangkok. Yesterday, my wife and daughter went to Thailand Export Center. They bought a watch yesterday for just USD2,000 when price is normally USD6,000 in our country. My wife and daughter are very very happy. You are very very lucky, Export Center is only open 7 days a year, so you have to take opportunity to go there now. (Draws in your map) You just walk straight, turn left and cross the railway station, and the export center is there. Go now before it closes! Thai people normally do not know how to speak English. Some only speak a few English words. These scam artists speak fluent English and are extremely friendly. Take note that normal guys do not bring a pen in their pockets, but I see a trend that these scam artists always bring a pen with them and always ask for your map for them to write the direction. I wonder why Thai government is not doing something about this given that tourism comprises a chunk of their economy. Anyway, if you meet these people, just do not mind them. We did not enjoy walking around Pratunam as there were no walkable side walks. The streets of Pratunam were also extremely crowded with vendors and bargain hunters. Our next destination for the day is Central World Mall. I know it’s just walking distance from Pratunam, but we got lost and want to get out of Pratunam as soon as possible. So we just took a cab and the driver smiled and told us that Central World Mall is just 5 minutes walk away. Central World Mall is one of the biggest malls in South East Asia but it lacks the appeal of Siam Paragon. It has huge and empty hallways making you feel bored and sleepy. 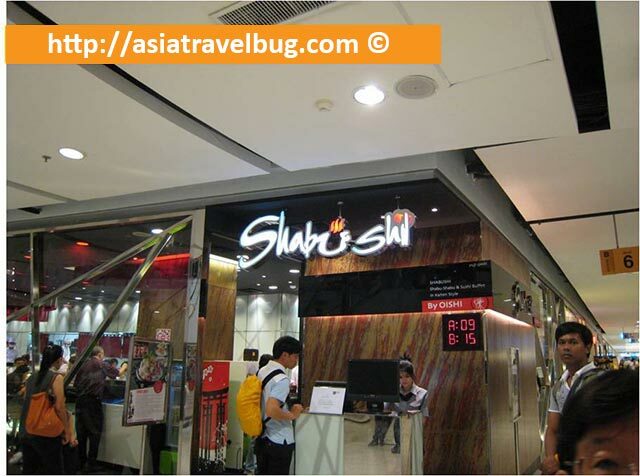 But in the mall’s 6th floor, there is a very good restaurant which I would highly recommend – Shabu Shi by Oishi. 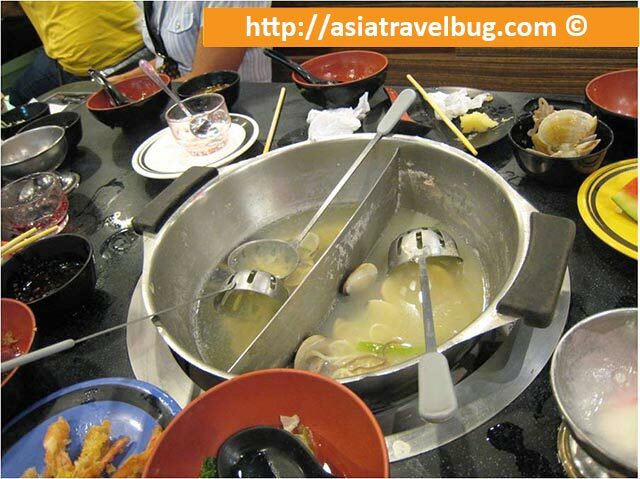 Shabu Shi is a Japanese restaurant which offers eat-all-you-can Shabu Shabu (hot pot cooking) and Sushi for just 220++ Baht (~USD 7++). Eating time is restricted to 1 hour and 15 minutes. 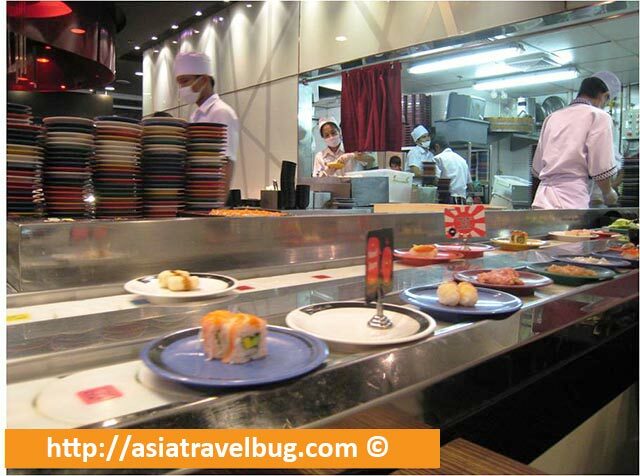 There is a conveyor belt in the middle where you can get sushi and shabu shabu ingredients all you want. Not only that, you also get to have unlimited tempura, drinks, fruits, deserts and ice cream. This restaurant is so popular that it is always jam packed with local Thais and queue is quite long. So, better be there early. For those going to Bangkok, this restaurant should not be missed! After a very long day, we got so tired and just wanted to go back to our hotel immediately after our dinner. But the taxis in Central World Mall were very choosy because of bad traffic. Imagine, one cab driver trying to charge us 150 Baht (~USD 4.50) back to our hotel when normal metered rate will cost only 50 Baht (~USD 1.50). We turned down the offer and just walked back home. Thanks to the elevated walkway just below BTS Siam and BTS Chitlom – it was a comfortable walk and we arrived in Urbana Langsuan Hotel in 30 minutes.